Urban Cummings talks about collecting vintage cigarette lighters, noting the history and evolution of lighters, the various types and manufacturers, and trends in the hobby in general. Urban has written two books on Ronson lighters. At the very beginning, my interest in lighters was about the mechanism. I had my first lighter when I was 14. I saved up my nickels and dimes. I grew up in Oakland, and bought my first cigarette lighter because I thought it was way cool. I didn’t smoke and I didn’t set fire to things. I just thought the lighter was really a beautiful piece of equipment and the whole idea of being able to push down your thumb and get a flame just really caught my fancy. I was attracted to the function of it. For example, up until Ronson invented the one-motion lighter, all the lighters, including the ones they made, were all strike lighters. You had a flint and you had a wand with a hard-metal tip on it, and you had a wick with fluid on it, and you scratched the flint with your wand. It created sparks, of course, and they ignited the fluid that’s on the wick. In a way it’s like a match. Collectors Weekly: Who was Ronson? Bakelite Ellis Lighter Corp. U.S.
Cummings: The name Ronson comes from the inventor’s name, Louis V. Aronson. The Ronson name was first used in 1909 for automobile wrenches that Mr. Aronson manufactured. This guy was an inventor. The name of the company from the very beginning was not Ronson; it was Art Metal Works. Louis Aronson graduated from metallurgical school when he was 17, and his first patent was for a gold-like metal that he used on lots of lighters and other things he made. He sold the patent for $5,000 and retained the right to use it himself. He took the $5,000 and started his company. He actually started in New York City, where he grew up and went to school. Within a couple of years, he moved Art Metal Works to Newark, New Jersey, and that’s where it remained until the 1960s. They finally closed the plant there and moved to a different location, still in New Jersey. In 1913, they made their first lighter. It was a strike lighter and they called it the Wonder Lighter. Collectors Weekly: Was Ronson the earliest mechanical lighter produced? Cummings: No. Let’s backtrack a bit to the invention of the flint. The flint is what makes the sparks. In a Zippo lighter, you have a wheel that you spin and there’s a spring that’s holding a flint up against the wheel, which creates sparks. Once again, the lighter fluid that’s in the wick ignites and you get a flame. The flint really revolutionized the world of lighters. Back then they were called cigar lighters. Ready-made cigarettes really didn’t become popular until around the time of World War I. The flint was invented by an Austrian man who was an inventor and some kind of scientist. That really created a whole new market for cigarette lighters because now it was a whole lot easier to make all kinds. But as I said, most of the early lighters were what’s commonly called a strike lighter, which is the wand with the metal tip and the wick at the end. So he did that, and called it the one-motion lighter. You push down on a thing called the thumb piece, and when you get it pushed all the way down, it does two things. On the way down, it starts spinning the wheel, which creates a spark, and when you push down on the thumb piece, it lifts up the cover over the wick. The wick goes down inside the lighter, and there’s a reservoir of fluid inside, so the wick is wet. If you didn’t cover up the wick, the fuel would evaporate way too quickly, so they have a cover called the snuffer cap. So you push down on the thumb piece, the snuffer cap lifts up, and the flint wheel spins to give you a spark to light the wick – all in one motion. Collectors Weekly: How many different designs are there? Cummings: Hundreds, probably. I’m in touch with a lot of collectors all over the world. There are two lighter clubs in the United States, and there’s a lighter club in Great Britain which is very good. There are lighter clubs in Japan and Italy and all over the world, and I’m in touch with a lot of them. Collectors often specialize. I have a friend in England. He belongs to the Lighter Club of Great Britain. His favorite thing to collect is lighters with unusual mechanisms, and believe me, there are lots of them out there. For example, the original Calibri had a very unusual mechanism. It had a lever on the side of the lighter that you pushed down, and that created the spark, as compared to a thumb piece on the top of the lighter that you pushed down. The idea of the whole thing is to create a spark, and the actual way that the spark is made varies a lot. Zippo, Evans, and Ronson are the three primary cigarette lighters made in the United States although there were lots and lots of them. For example, early electric lighters were little ceramic things, and some of them plugged into a house current, and it would have a heating element on the bottom that gets hot enough to light the end of your cigarette. They plug into the wall, and you push the button. The car lighter runs on a 12-volt automobile battery. These other ones run on house current, which is 115 volts. General Electric continued to make an electric lighter. Most of those ones with the heating element fell out of favor by the time the one-motion lighter and the flint wheel and things like that came along. People stopped using the electric ones, but General Electric actually continued to make an electric lighter. Collectors Weekly: Are there electric lighters today? Cummings: Yes. Today I would say 90 percent, maybe even 98 percent of all cigarettes and other things are lit with these cheap throwaway plastic BICs, and they’re made by other brands. I don’t know anybody in the lighter clubs that collect BICs because they’re everywhere. Why would you want to bother collecting them? Collectors Weekly: When you’re looking for lighters, what do you look for? Cummings: Lighters is a small part of what my wife and I collect. We are very enthusiastic about the 1930s and into the 1940s, the Art Deco period. From the beginning of the 1930s right up to World War II, Art Deco was a very specific way to design and make things. There are lots of books about it. We collect all kinds of things from the Art Deco period, so I look for cigarette lighters which reflect that design. By the way, you should realize that Art Metal Works made a huge variety of metal things which were incredibly beautiful Art Deco pieces. I have figural pieces, statues, that are so Art Deco, it’ll blow your mind. They’re just gorgeous. Going back to the early 1900s when people’s houses had gas lamps which really smelled the house up, everybody had incense burners to try to cancel the smell from the gas flames. Before everybody had electric light bulbs, people burned gas lights. Ronson made some incredibly beautiful incense burners. I’ve got a lot of those. Another thing that people collect is incense burners. Another friend of mine collects Ronson bookends, some very Art Deco pieces. My collection runs from the very beginnings of Ronson Corporation, which was started in 1896 or 1897. In 1895, Aronson resigned his teaching position to devote full time to his business. 1896 is the date that Art Metal Works (Ronson) was incorporated and moved to Newark, New Jersey. Collectors Weekly: Are there specific lighter models you look for? Cummings: This year’s lighter show is in Cleveland. Every other year it’s in Las Vegas. I always have my eye open for something interesting or unusual, but I have so many thousands of lighters. I know I have at least 5,000. I’m really trying to sell them now. I’ve got too many of them. But if I find something really neat, I’ll buy it. As far as what I collect now, it’s not really guided so much by the mechanism as it is the overall design. I also collect lighters made in the United States and lighters that have American companies on them. For instance, I like the Zippos that have the business logo of companies that are in the United States that did business for the last hundred years. Some of the best lighters around were made in places other than the United States. For example, every cigarette lighter collector who’s worth his weight knows about Dunhill. It’s an English company. The Dunhill Aquarium was a table model lighter that had little fish built in to the acrylic. It’s a very desirable lighter and they go for thousands of dollars. Collectors Weekly: What’s a table model lighter? Cummings: There are two basic kinds of lighters – table models and pocket models. Pocket models obviously are intended to be kept in your pocket, but some pocket models are lighters and cigarette case combinations. The Ronson Master Pack was very popular in the ’30s, ‘40s, and they continued to make it up into the ‘50s. They would combine the lighter with the cigarette case and a watch, and those are very collectible. Ronson targeted females. Once smoking was okay for women in the 1930s, Ronson really catered to the female market, and there are some absolutely gorgeous Ronson cigarette cases and lighters. They’d combine a lady’s compact. They’re so beautiful. They’d put rhinestones on the front of them. The lighter pack would have beautiful enameled designs, very Art Deco, very colorful. Sometimes it would be a lighter and a cigarette case. Sometimes they would combine the lighter-cigarette case and the lady’s compact all in one piece. There’re 417 different models that Ronson made between 1913 and the year 2000, and they’re all in my second book. There’s this whole section there about strike lighters. There’s a section about the lady’s compact lighters, the lighter pack, the lighter case. It just goes on and on. In order to write authoritatively about Ronson lighters you need to understand all the things they made. There’s another book that comes from Holland, Amsterdam, written by a friend of mine. It’s called “The Legend of the Lighter.” It is an absolutely gorgeous book and it gives a real European slant on lighters. In terms of other makers, a lot of people collect Zippos. Well, if you’ve seen one Zippo, you’ve seen them all. Zippo does have some table models, but they don’t make table models at all like they used to. I would say 95 percent of all Zippos are pocket models, and they’re all the same. The only difference is there’s a smaller one made for ladies, called the Slim, and then there’s the standard size. It’s the graphics on the front of the Zippo that people collect. They take a metal lighter and put a design on it. It’s usually done by a machine, so it’s very reflective. Then they’ll cover it with glass with a color on it, and that hard glass covering amplifies the design. The French call it guilloche. They’re absolutely beautiful. I have a couple of them. They go for hundreds of dollars. Collectors Weekly: Did lighter designs tend to mimic the styles of the times? Cummings: In general, yes. But people that made cigarette lighters did them in so many different ways, and it’s not the lighter itself but the base. For example, I’ve been in communication with a lady in Germany who sent me a picture of a Ronson lighter, but it was specially made for a company that made pumps. So here’s a model of a pump, and on top of it, there’s a lighter. I have literally dozens and dozens of different lighters that were put onto things. The people in Japan were making lighters in a shape of ladies’ lipstick cases or in the shape of typewriters. In the 1950s, the Japanese made lighters that looked like little typewriters, microphones, outboard motors, TV sets. Ronson, especially during their butane period, made some absolutely gorgeous designs that looked like a little tabletop. Ronson aimed their sales at a market which was really upscale. For example, I have several examples of Lalique glass with a Ronson lighter inside. The very best china made in the world, like Lenox, had lighters built into them. Collectors Weekly: What’s been one of your most exciting lighter finds? Cummings: Back when I was totally eager beaver back in the 1980s and ‘90s, I would go to every flea market, every antique store, every swap meet, garage sale, everything. I was out on the hunt every weekend. I spent an enormous amount of time. On my honeymoon with my wife, we went to New Jersey to visit her mom, and we spent a lot of time going to antique stores. I found some great things. The greatest find I ever had was this: I would go every month to the Foothill College flea market, and ask people, “Do you have any old cigarette lighters?” There was one lady with a camper shell on a pickup truck, and she sold stuff out of her camper shell at the flea market. She said, “Yes, I have this cigar box of old lighters. Let me get it for you.” So she goes back in and brings it out, and it’s full of flint dust because flints deteriorate over a period of time and they get powdery. Most of it was what I consider junk, but there in the midst was an example of Zippo’s very first lighter. It’s called an outside hinge. 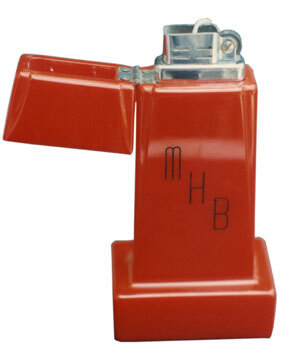 When Zippo first started making lighters, they had the hinge on the outside. Within a year or two, they put it on the inside. So outside hinge Zippos are very rare and hard to find and worth thousands of dollars, depending on the condition and what’s on them. I said to the lady, “What do you want for the box?” because I wasn’t going to tell her I just wanted that one. She said, “How about $10?” So I found at least a thousand-dollar lighter for 10 bucks. Now, that will light your fire. I think people are born with a collecting instinct, because as an 8- or 9-year-old boy, I used to go to my dad and borrow 50 cents so I could go down to the bank on Saturday morning and go up to the teller’s cage and get a roll of pennies. I would look through all these pennies and find the ones that I didn’t have because I had one of those little blue coin collectible books that had little slots that you can push your coins in. I really liked collecting things when I was a little boy, and it’s been that way ever since. Collectors Weekly: Is there a difference between cigarette lighters and cigar lighters? Cummings: None. Today’s cigar smokers, by and large, do not want to use wick lighters because they claim that the lighter fluid, when it burns, spoils the taste of their cigar. Today’s cigar lighters insist on butane. I don’t believe it, but then I’m not a cigar smoker. From the early days on, a lot of the patents say cigar lighter. Cigarettes didn’t really become popular until the ‘20s, but if you look at those advertisements, they don’t even refer to cigars anymore. It’s all about Chesterfield or Pall Mall or whatever cigarettes. So as far as differentiating between cigar lighters and cigarette lighters, no, not really, because a flame is a flame and you can use it to light a candle or whatever you want. I think it was just in their advertising that they’re differentiated. I’d have to really search my memory to think about a lighter which is made exclusively for cigars. There are, however, lighters made specifically for pipe smokers. Zippo made one at one time. Also, there’s a very clever one by Beattie Jet that shoots out a one-inch long flame. Collectors Weekly: Why aren’t lighters made with the same craftsmanship anymore? Cummings: I think it’s the throwaway generation. People don’t value things like a cigarette lighter anymore, so that’s why the plastic BIC throwaways appeal to them. Up into the 1950s – it all changed in the ‘70s and ‘80s – people’s personal items were important. Nowadays, I guess an expensive watch is a big deal or if you got a Jaguar or a fancy car or if you’re getting really pricey clothes. But back in the ‘30s, if you had a really expensive fountain pen, you were important. If you had very expensive cufflinks, you were important. They were called personal accessories, and your cigarette lighter was one too. Back then, everybody smoked. I used to smoke. My parents didn’t, but I used to smoke from the time I was 18 until I was about 38. Your cigarette lighter was a personal accessory. Not only did people stop smoking, but what people value for accessories has totally changed. That’s what made the lighter fall out of favor. Collectors Weekly: Do you collect any other type of tobacciana? Cummings: Yes. I never collected the bands that go around cigars, but I collected ashtrays. 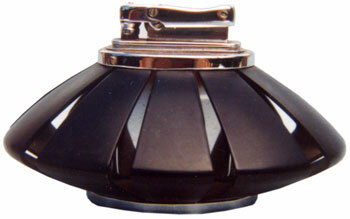 There are some absolutely gorgeous ashtrays out there. I have one ashtray from the Ile de France, which was a famous luxury liner from the ‘30s, and I don’t know when it went out of business. There are collectible books on ashtrays. There’s so much variety. There’s metal, there’s ceramic, there’s glass. In fact, some of the Lalique pieces include an ashtray with it. So I have collected ashtrays. I said I’d never do this, but I did it anyway. I also said I would never collect matchbooks. Well, guess what? A man called me many years ago and said, “I’d sure like to have a copy of your book,” and he had a book on matchbooks, so we traded – my lighter book for his matchbook book – and that got me started. All of a sudden, I would run into people with these matchbooks that had stuff on the covers that really interested me like World War II airplanes and companies from the ‘30s and locations like the Waldorf Astoria hotel. You name it. They all go back to the time when everybody smoked. They needed matches, so matchbook covers were a big way of advertising, and I ended up collecting those. I even collected packs of old cigarettes, foreign cigarettes. Marlboro used to make a women’s cigarette that had a red band on the part she puts in her mouth because otherwise, if the white paper showed up your lipstick, it looked ugly. So I have a pack of cigarettes for women. That’s cool. Collectors Weekly: Are BIC throwaways an American thing or did lighters change around the world, too? Cummings: I think throwaway lighters are worldwide. Ronson had a branch in England, going back into the ‘50s that lasted until the ‘80s or maybe ‘90s, and they made throwaway Ronsons. I have an advertising thing for them. It was a great ad because it was a beautiful array of different-colored plastics, but it was a disposable lighter. But Ronson made them refillable. Ronson today is still in business because because they sell lighter fluid. They sell butane fuel. So they would make it refillable so they could sell more butane. Zippo today has not changed much from its early beginnings. For a period there, Zippo was having butane lighters made in Japan, and they were very, very well made. They had a great valve that didn’t leak. I had a number of those in my collection; now I just keep a few for reference. Today Zippo is still just selling fluid and flints and wick lighters. 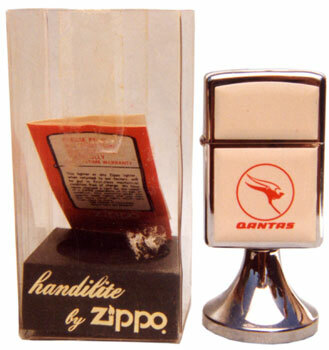 Zippo has not made a butane lighter for a long time. China and Japan are Zippo’s biggest markets now, and all they make is their same old standard lighter. No change. I do have a plastic throwaway lighter that I saved. It was from the 1980-something Winter Olympics that was in Moscow. Jimmy Carter, getting even with the Russians, decided to cancel our participation in the Moscow Olympics that year, and they had already made the lighters. I found one of them at a flea market, and I collected it because it was an Olympics that the United States never participated in. I think it’s one of the few throwaway lighters that I’ve collected. Collectors Weekly: Are there lighter shows? Cummings: Yes. The two clubs in the United States each put on a couple of lighter shows a year. To me, that’s the best place to find lighters, because out in the public domain, really nice, old lighters have just about evaporated. People have been collecting them, so they’re pretty much gone. So the lighter shows are the place I go nowadays to find great lighters. The lighter club shows are a great place not only to get to hang with your friends, but to find great, old pieces, because buying from other collectors is where you get some really great things. People are still finding great things on eBay, so it really is a great resource, no doubt about that. Going to a lighter show or participating in a lighter club with other collectors is going to be your best resource in the long run because you can see exactly what you’re getting. I’m a great believer in that. The lighter clubs and the lighter shows are also a great way to network with your fellow collectors. It’s just really a great resource. I have friends all over the world because of it. That’s another thing about collecting that’s worthy of mention: collecting allows you to make friends all over the world that collect the same things you do. I have friends in Japan and Italy and England and Europe and all over the United States all because of my collecting. I really believe that collecting enhances your quality of life. Collectors Weekly: Why did you write a book about Ronson lighters? Cummings: My wife and I went to hundreds of flea markets, garage sales, and antique/collectible stores in search of old lighters. I would usually ask, “Do you have any old cigarette lighters?” At some point, I began asking, “Do you have any old Ronsons?” After a number of dealers under 30-35 years old said, “What’s a Ronson?” I realized a big part of America’s history was rapidly fading away. I wanted to record and preserve this small piece of our past. Hence, the book. Collectors Weekly: Do you have anything else that you’d like to add? Cummings: My wife and I collect anything from the Art Deco period. There was a World’s Fair in Chicago in the early 1930s called Chicago World’s Fair Century of Progress. That was the most Art Deco time period, so if you like Art Deco, the Chicago World’s Fair Century of Progress was just the most beautiful thing you can imagine. They don’t do things like that anymore. So my wife and I love to collect things from that World’s Fair. There’s just an enormous amount of incredible things. 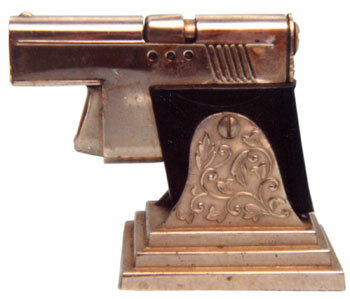 In fact, there’s a Ronson pipe holder, and on the top of it is a 1933 Century of Progress emblem, logo. Once you get hooked on something, you’re hooked for life, I’m afraid. We don’t go as far as furniture. The Deco things we collect are what they call smalls. I don’t have a house big enough to allow me to collect furniture, although I have some friends that have the most beautiful Art Deco furniture. But the smalls are really enjoyable. I have a lighter in the shape of an old car.If you press a button on the side the hood opens to expose the wick.The underside is stamped “made in occupied japan ” Does anyone know anything about this lighter? It is the size of a matchbox car. 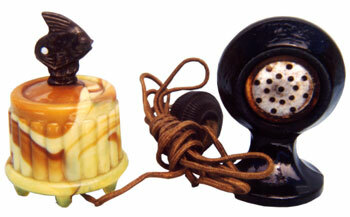 I have a “VINTAGE ASR GREEN BAKELITE CIGARETTE LIGHTER” It is marked “ASR” & “MADE IN USA”. Does anyone know what it might be worth? I was given a lighter as a gift. It was apparently bought in Greece, as to the exact date(late 60’s early 70’s) I’m not entirely sure. There are no dates of any kind on it and the only identifying marks are what appear to be “CSPRING”(with the C connecting to the G on the bottom like an underline) and “Cyma” beside it. It is still in the original box and comes with a flint holder and tiny brush. does anyone have any info on this lighter or an idea if it’s a collectable? Thank you. I have an old Prince lighter with the name Minx on it. Its silver and like a lipstick tube. I know nothing about it and as of yet have found no info on it. ANyone have knowledge on this? Thanks. I believe I have an Art Deco piece. 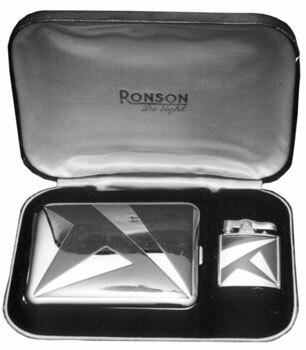 “Ronson Ten-A-Case cigarette lighter with cigarette holder in one. The felt pocket and box all in excellent shape. Felt pocket has Ronson stamped on it, as well as the box has the “Ten-A-Case Fashioned by RONSON” stamped on the front, with “WORLD’S GREATEST LIGHTER” on the lower right hand corner. The outside of the lighter has the name of my parent’s friend engraved on it. It was an old friend and her name was Zana which is the name engraved. I’m pretty sure it’s from the 30’s ish, she was born in 1898 and passed away in 1990. I’m curious how much the case would be; or since it’s monogrammed is it worth more or less? Great article. Im 15 years old and my collection is up to around 80 lighters. Your exactly right about the throw away jeneration. 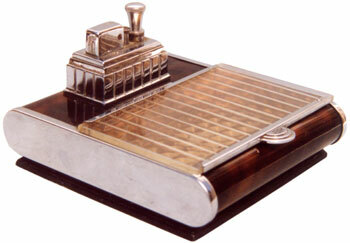 My favorite lighter is the 1920’s Thorens with the wind gard. How old is a Scotty dog leaning on a lighter with the word “book” from Occupied Japan and a stamp of a ship on bottom? Maybe bronze. I am trying to discover the manufacturer of a very beautiful combination case and lighter thought to be recovered from a German U-boat officer during the prisoner processing in 1944 or 1945. The case has a bold embosed rendering of the Harbor at Gibralter and the only Id info on the case is on the brass retaining springs clips that is stamped, “hillshenstone” The lighter is a ronson type that has an Id stmping on the bottom that says “Falcon”, Made in England. The lighter/case combo was given to me by my father in law who was a Navey Shore patrol officer. The prisoner who was “Relieved” of the item said that it was taken from a British casualty of a submarine encounter somewhere in the north atlantic. The German officer was being processed at Norfolk Virginia. I have tried to locate the origin of the lighter and case but the British folks I spoke to via the internet have been of no help to date. It’s really a beautiful piece of work. I would appriciate any info. Soho Joe. I have a (Japanese ) Nichika gas lighter jet flame, the patent number is 20610. This lighter has never been used, it is still in the original box, brown pouch and still has the owners manual. The lighter is with gold Japanese symbols. Could you plese tell me if it is worth anything and some history on this lighter? I have a Hav A Tampa 10k mens ring. All i can find out is that they were not sold in stores, but were given out from the company for years of service. It is in mint condition, made to look just like the cigar lable with red paint all intack. Would like to know if all i know is true and about the age of it? Thank you Walter. I have a Frank M. Whiting lighter marked Sterling Pat. Pending about 2 1/2 inch across and 2 1/2 in tall glass base silver rim and silver cone on top you pull up and you have a flint lighter..either a purse or a table lighter..common or scarce??? A pipe, cigar, or cigarette lit with the old styled, liquid fueled lighter taste absolutely terrible – you might as well have used a R.R. signal lantern, and have destroyed the pleasure of a fine tobacco/smoke. It’s matches, electric, or butane all the way – you can never go back. Friends of my parents had two foals born with in days of each other on their farm some years ago. Both were palomino coloured. They named one Star and the other Ronson ‘because he was lighter’. It was years before I understood the significance of the name :-). Greetings from New Zealand…I was left a very attractive lighter in my granddad’s effects when he passed away. I would love to find out more about it and hope you can be of some help. It is a Starlon Valentina-S U.S.A. Pat. 3044504. It has a lovely decoration of mother-of-pearl on the front with paua (abalone?) diamond shaped inserts. It is in very good condition. Can you shed any light (no pun intended) on it’s history or value? Many thanks from Cathie. I have a Penguin Cigarette lighter and case both with ‘The Ventures’ on them and would like to know how much it’s worth. I’ve looked all over the internet and haven’t found anything at all about it so i figure it’s very rare. My late father Ty Willard was a close friend of Nokie Edwards and played with him during the 60’s and i imagine that’s who he got it from. He was also a session guitarist on Mel Taylor and The Magics in Action’s Drums a-go-go album. I have a really unusual lighter im no sure if it is a military boat or plane. It is green has wings of some sort with stars engraved on each. Has thick clear glass on front with american flag and big eagles head under glass..when you open the lighter red white and blue tiny lites start flashing. On the nose of the boat or plane are 2 tiny holes with tiny metal tube shaped pieces inside . I dont understand what those are for. I cant find any inscription but just under the lighters lid inside is a sticker with the number 35 on it. Part of the top of the lighter looks like it might be silver and part chrome. Im completely baffled since no inscription. I cant even say where the lighter came from for the reason i have it is a mother’s worst nightmare so i am unable to ask about it…..thank u for your time. Anything you can tell me about a 1940’s-1950’s gold cigarette lighter with a miniature wind-up music box built into the base of the lighter would be most appreciated…it had a typical flint-wheel spark and wick, the outside of the case covered with a pattern of stripes, vertical raised areas. There are a lot of art deco smoke stands out there in the ‘antique’ market with missing parts (ash trays and lighters…). Why doesn’t someone or some company make and sell ashtrays and lighters with a footprint that will fit some of these jewels so they can be used again? I’m researching a 14k gold electroplate Ronson that looks much like a Dunhill rollagas. No model name on it. Any knowledge of this one? I don’t know the age. Not modern but can’t be all that old either. I have recently been given by my father in law two very old electric lighters in excellent condition one screws into a lamp socket and then a wire takes it to a lighter that also has a tossel on it says it was made in Chicago on the side, the other one plugs into an outlet and stands straight up with a button on the side from looking at different web sites they both appear to be from the 1930’s. I’m curious to know if they are collectible. Can anyone help ? I have a table cigarette lighter that has a golden glass bottom about 2 & 1/2 inchs for the lighter fluid. The glass bottom at the top has stars around it and eagles around the middle. The silver top of the lighter says Japan and that is the only thing. No other letters or numbers. I would like to know if its worth anything and maybe history about it. Thanks in advance for any help. So my question or comment this concerning this lighter that I have and it is still in a case and it has the warranty paper in the cases well, but I can find no nothing on the information that the case gives concerning the lighter, not on Google or eBay or anything and I would be most grateful for any information or systems and I might be able to get. So, the case says ( L’ Davinchi ) & right below that it says (Designer Cigarette Lighter). I looked up this & found absolutely nothing. On the warranty paper that was laying below the lighter inside of the case it says at the bottom The Davinchi Co., MFG IN KOREA NATIONAL HEADQUARTERS U.S.A. I would love any information that you guys would be so kind as to give me and I thank you for your time and any further help that I may receive. Thank you.